Orienting employees to their workplaces and their jobs is one of the most neglected functions in many organizations. An employee handbook and piles of paperwork are not sufficient anymore when it comes to welcoming a new employee to your organization. The most frequent complaints about new employee orientation are that it is overwhelming, boring, or that the new employee is left to sink or swim. Employees feel as if the organization dumped too much information on them which they were supposed to understand and implement in much too short of a time period. The result is often a confused new employee who is not as productive as he could be. He is also more likely to leave the organization within a year. It is costly to both the employer and the employee. Multiply this by the number of employees that you hire each year, and the cost of turnover becomes significant. With an ongoing labor crunch, developing an effective employee orientation experience continues to be crucial. It is critical that new hire programs are carefully planned to educate the employee about the organization's values and history and about who is who in the organization. A well thought out orientation program, whether it lasts one day or six months, will help not only in the retention of employees but also in the increases in employee productivity. Organizations that have good orientation programs get new people up to speed faster, have better alignment between what the employees do and what the organization needs them to do, and have lower turnover rates. Employers have to realize that orientation isn't just a nice gesture put on by the organization. It serves as an important element of the new employee welcome and organization integration. Proper orientation can help the employee get up to speed much more quickly, thereby reducing the costs associated with learning the job. Any employee, when put into a new, strange situation, will experience anxiety that can impede his or her ability to learn to do the job. Proper orientation helps to reduce anxiety that results from entering into an unknown situation and helps provide guidelines for behavior and conduct, so the employee doesn't have to experience the stress of guessing. Employee turnover increases as employees feel they are not valued or are put in positions where they can't possibly do their jobs. Orientation shows that the organization values the employee, and helps provide the tools necessary for succeeding in the job. Simply put, the better the initial orientation, the less likely that supervisors and coworkers will have to spend time teaching the employee. You can effectively and efficiently cover all of the things about the company, the departments, the work environment, and the culture during orientation. The manager and coworkers will then need only to reinforce these concepts. It is important that employees learn as soon as possible what is expected of them, and what to expect from others, in addition to learning about the values and attitudes of the organization. While people can learn from experience, they will make many mistakes that are unnecessary and potentially damaging. The main reasons orientation programs fail: The program was not planned; the employee was unaware of the job requirements; the employee does not feel welcome. Employee orientation is important—orientation provides a lot of benefits, and you can use feedback from participating employees to make your orientations even better. All new employees should complete a new employee orientation program that is designed to assist them in adjusting to their jobs and work environment and to instill a positive work attitude and motivation at the onset. A thoughtful new employee orientation program can reduce turnover and save an organization thousands of dollars. One reason people change jobs is that they never feel welcome or part of the organization they join. What Do You Need to Include in the Process? The most important principle to convey during orientation is your commitment to continuous improvement and continual learning. That way, new employees become comfortable with asking questions to obtain the information that they need to learn, problem solve and make decisions. A well-thought-out orientation process takes energy, time and commitment. However, it usually pays off for the individual employee, the department, and the organization. One such example is Mecklenburg County's (North Carolina) success in revamping its employee orientation program. The employer wanted to live up to its credo of employees being the organization's greatest resource. In 1996, as part of a larger initiative to redesign services to meet customer needs, the Mecklenburg County Human Resources Department staff made a smart decision. They viewed new employees as part of their customer base and asked their customers what they wanted. Employees were asked what they wanted and needed from orientation. They were also asked what they liked and didn't like about orientation. New employees were asked what they wanted to know about the organization. Additionally, the organization's senior managers were asked what they believed was important for employees to learn when joining the county payroll. Using feedback collected from employees, Mecklenburg's HR training staff first realized that meeting employees' needs required more than a half day training session. Trusting employee feedback, the trainers crafted a one-day orientation that gave employees what they said they wanted and what senior management believed employees needed to know. Essentially, the orientation mix now includes the less exciting topics such as W-2s and various policies and procedures, but it also includes details that let the employee know something about the organization. Need more on how to plan an employee orientation that's beneficial and fun? Human Resource professionals and line managers first need to consider key new employee orientation planning questions before implementing or revamping a current program. These are the key questions to ask. What things do new employees need to know about this work environment that would make them more comfortable? What impression and impact do you want to have on a new employee's first day? What key policies and procedures must employees be aware of on the first day to avoid mistakes on the second day? Concentrate on vital issues. What special things (desk, work area, equipment, special instructions) can you provide to make new employees feel comfortable, welcome and secure? What positive experience can you provide for the new employee that she could discuss with her family at the end of the first day of work? The experience should be something to make the new employee feel valued by the organization. How can you help the new employee's supervisor be available to the new employee on the first day to provide personal attention and to convey a clear message that the new employee is an important addition to the work team? Photo Match: after the tour. Each employee is provided photos of other employees and a list of names. The object is to match the name with the face. Signature Hunt: While employees are touring the facility, provide them with a piece of paper with the names of several associates they will be meeting. They are then asked to obtain the signatures of the people they meet. The employee who obtains the most signatures from a variety of new coworkers gets a prize. Other games that pertain to what the employee learned during orientation are also effective assurances that orientation is successful. Begin the process before the new person starts work. Send an agenda to the new associate with the offer letter so that the employee knows what to expect. Stay in touch after he or she has accepted the position to answer questions. Make sure the new person's work area is ready for the first day of work. Make sure that key coworkers know the employee is starting and encourage them to come to say "hello" before orientation begins. A new employee welcome letter with an agenda allows coworkers to stay in touch with the new employee and her schedule. Assign a mentor or buddy, to show the new person around, make introductions, and start training. Let the mentor have sufficient notice so that they can make preparations. The mentoring relationship should continue for 90 days and may continue much longer if the pair makes a great connection. Many relationships go on for years and may even turn into a sponsorship. Start with the basics. People become productive sooner if they are firmly grounded in the basic knowledge they need to understand their job. Focus on the why, when, where, and how of the position before expecting them to handle assignments or big projects. Don't overwhelm them with too much information. Provide samples about how to complete forms and the person's job description with the orientation packet. Have some fun. Concentrate only on the very important topics of the handbook. Play some games—this can help people learn. Provide a list of FAQs with a contact person, and phone number or extension. 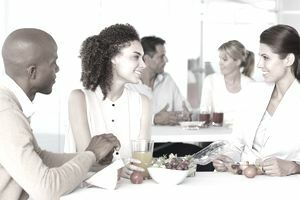 Plan to take the new employee to lunch, or ask others to join the new employee in the lunchroom or in a conference room with other members of the department. The first day on the job is not the day to leave the new employee alone during lunch. This is a good time for the supervisor to take the employee to lunch, include other coworkers, and make sure the employee is at ease. It's also an excellent environment in which employees can get to know each other and the new coworker. Keep the new person's family in mind. A new job means an adjustment for the entire family, especially if they have relocated. Do what you can to ease the transition and help them feel comfortable in the community. Ask for feedback. Find out from former new hires how they perceived the orientation process, and don't be afraid to make changes based on those recommendations. You can send an evaluation two to four weeks after the employee has started, and ask: Now that you have been with the company awhile did the new employee orientation meet your needs? After the employee has worked for you for a while, and he finds out what he should have learned but did not at the orientation. At Mecklenburg County, after their redesign process, one of the trainers, Allyson Birbiglia said, "We recognize that we have to continuously improve orientation to meet the changing needs of our customers. What works now may not serve our employees well next month or next year." An effective orientation program—or the lack of one—will make a significant difference in how quickly a new employee becomes productive and has other long-term impacts on your organization. The end of the first day, the end of the first week, the end of each day in your employment, is just as important as the beginning. Help your employees feel that you want them to come back the next day, and the next, and the next. Dr. Judith Brown is a Program Manager for Policy and Performance Management at Naval Intelligence.